I'm making over $400 / month with my music— mostly through Spotify. Of course that’s not enough to support a full-time artist but that’s not what I’m trying to be. I don't tour, I don't sell merch and I'm not on a label. I just want to make music and Spotify is making that possible. Earnings over the last 9 months— averaging $443 / month (and growing!). Promoting my music before Spotify was awful. I would spend hours cold emailing bloggers— desperate to get a feature. It was boring, monotonous work and it couldn't be automated. Getting written up on blog would result in a short bump in listens. But once I was on Spotify I started to get featured on Discover Weekly, a personalized playlist sent to users every Monday based on their musical preferences. Discover Weekly changed everything by giving me something incredibly valuable: a consistent stream of new listeners. I didn’t even have to do anything for it. No cold outreach. Nothing. They just arrived most Mondays. Discover Weekly provides a steady flow of new listeners most Mondays. But what’s been even better than the data is the serendipitous events that make me feel like the momentum behind my music is growing. Plus I get at least a few DMs and emails from listeners every week. They often just say things like 'Hi!' or ask me about song meanings or tell me they introduced their friends to a song. I can't communicate the feeling of getting these DMs and emails. It makes me want to make more music. It puts a spring in my step. If you ever need to feel good about the Internet again— I’d suggest releasing music online. You’ll be bowled over by how encouraging people are. There are three types of Spotify playlists: algorthmic (example: Discover Weekly), editorial (created by Spotify's official human editor) and listener (anyone can make). The conventional wisdom for getting on Discover Weekly is that you first need to be featured on an editorial playlist first. While that’s probably a good first step, it’s not entirely true— my band BamBoo has never been on an editorial playlist and we've received 22,000+ streams from Discover Weekly. Official Spotify playlists have the Spotify icon in the top left corner. I have no insight into how you get on editorial playlists. I've been fortunate to be on 9 editorial playlists but I couldn’t tell you why— it just happened. The best tip I have for getting on editorial playlists is to release singles. You see, you usually need to submit your music to Spotify 4 weeks before your release date (this is the same for all streaming services). During that 4-week span Spotify lets you submit one song for their editors to consider for playlists. Because you can only submit one song, it’s best to space out releases. That way you can have ten singles considered by Spotify editors— rather than one single from an album for an entire year. 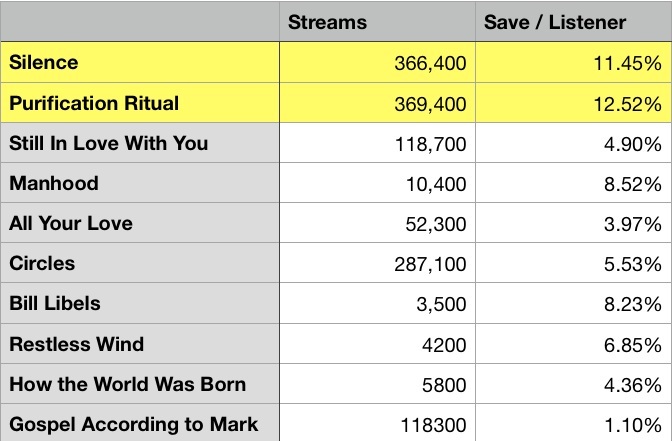 My songs with high save per listener rates do the best on Discover Weekly. Can you pay to be on playlists? The term for paying to be on playlists is payola. Payola is against Spotify’s rules— though most indie artists will tell you in a conspiratorial tone that music labels (part owners of Spotify) have special access to playlist promotion. Instead of paying directly for placement, there are playlist promotion companies (example: PlayListPush, SubmitHub and Streaming Promotions) that promote your music to curators of listener playlists— which I believe hold less weight than editorial playlists on Spotify. If you’re an indie artist you will get lots of cold-emails from playlist promotion companies. I’ve tried a few and had modest success. I’ll take plays wherever I can get them but… Spotify has done way, way more for me than Apple Music. Spotify vs Apple Music streams in the 48 weeks. This is of course totally anecdotal! Artists should be truth tellers not hustling entrepreneurs. But in todays world that's not even close to possible. To be a full-time artist you have to hustle and grind. Your Instagram has to be on point. You have to tour constantly. You have to sell merch. You gotta start a Patreon. Anything to support the art. I don’t want to do that stuff. I just want to make music. Preferably in my evenings when I'm done work at my day job. That's what Spotify is letting me do and I'm actually earning a bit of money. I'm not getting rich or famous but I’m not sure that's worth aspiring towards anyways. I'm making music for people who want to hear to it. Anything beyond that is a bonus. Thanks for reading. Sign up to my blog email list to be notified of new posts.